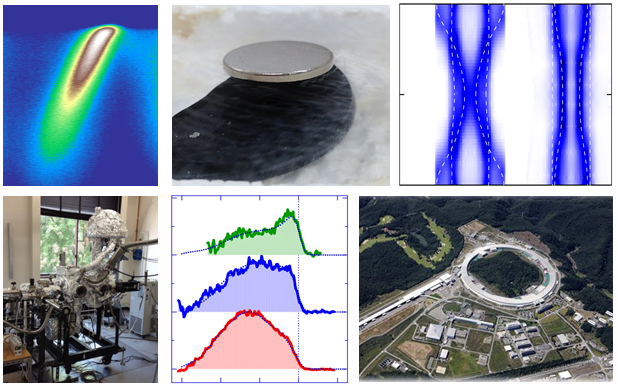 We are investigating the mechanism of the high-Tc superconductivity, metal- insulator transition, and orbital ordering in the strongly correlated electron systems by using photoemission spectroscopy. While over thirty years have passed since the discovery of the high-Tc cuprates superconductors, the mechanism of the superconductivity has not been clarified yet. In 2008, a Japanese research group discovered iron-based superconductors, which has given a new impact on the research field of superconductivity. These materials show various complex physical properties originating from strong electron-electron interactions and electron-phonon interactions. In order to approach the origin of the physical properties such as high-Tc superconductivity, photoemission spectroscopy is a powerful tool because one can directly take out electrons from the inside of solids. One can approach the origin of the novel physical properties of the material by analyzing of the electronic structure such as electron energy dispersions, Fermi surfaces, and superconducting gaps. Copyright © Cis-trans, Inc. All rights reserved.